Councilman Alex Mendez, who has been under heavy fire for his problem-plagued personal, business, and campaign finances for the past weeks, is now taking fire from a super PAC seeking to eliminate him from the six men mayoral race. 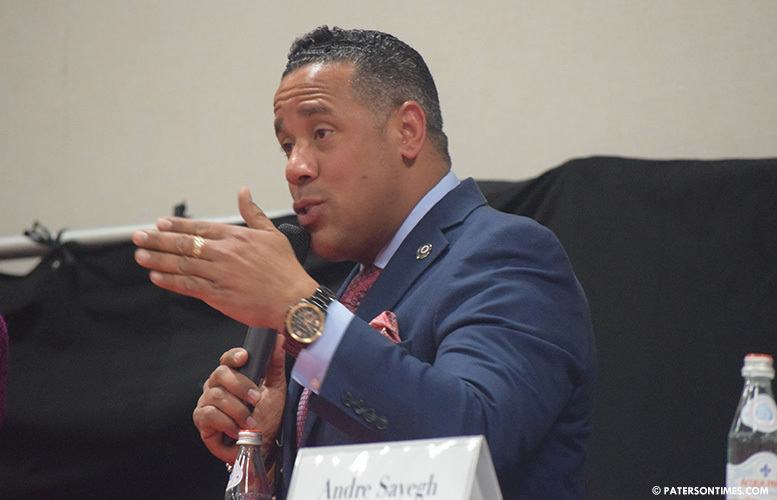 Mendez’s people blasted councilman Andre Sayegh on Tuesday night for a mailer sent out to voters in the city by the super PAC, the Progressive Values Committee of Bayonne. His team argues some of the people in the political action committee have direct ties to Sayegh. The flyer voters received on Tuesday. Mendez’s campaign estimates thousands of voters were recipients of the mailer. 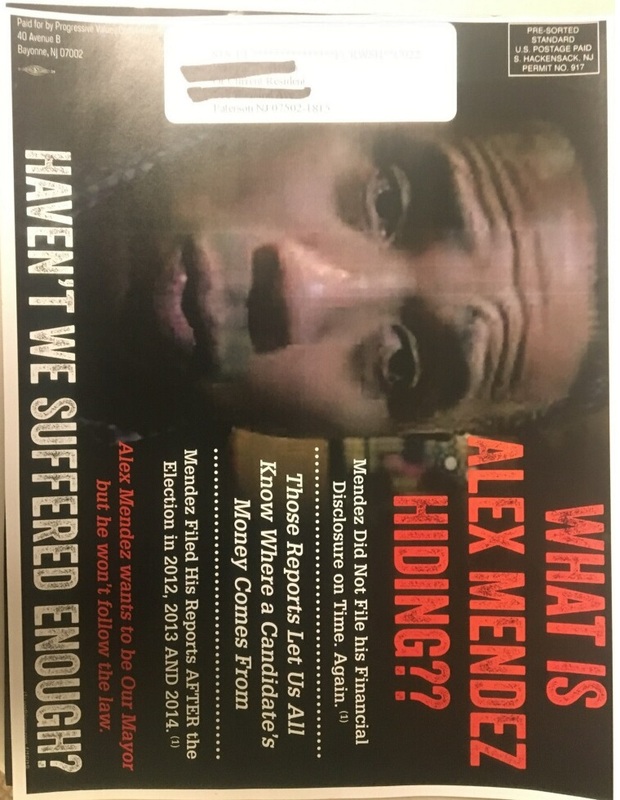 The flyer asks, “What is Alex Mendez hiding?” while stating Mendez failed to file campaign finance reports on time in 2012, 2013, and 2014. Mendez, who has been delinquent in filing his campaign reports in his past three bids for public office, said the photo on the flyer, which was viewed by his 9-year-old son, makes him look like a criminal. Mendez accused Sayegh of sending the flyer via his donor “lying” to the community. “I have a good relationship with ELEC. In 2012 and 2013, I presented my report. I’ve been late on my last report. That’s not criminal,” said Mendez, who is three weeks late in filing his 29-day pre-election report. Mendez has never filed his reports on time. After his successful 2014 election, Mendez (pictured) was an entire year late in filing his 20-day post-election campaign finance report. Sayegh has said Mendez is hiding “dark” and “dirty” money by failing to file campaign reports on time. “He’s not telling us where his money is coming from. He’s not telling us how he’s paying for his campaign materials,” said Sayegh on Wednesday morning. Of the six candidates running Mendez has the most campaign signs in the city, according to three of his opponents. “I’d venture to say he has more signs than all of us combined,” said Sayegh. Sayegh has denied having anything to do with the mailer that was released on Tuesday. “I’m being very frank with you. Yesterday, I saw that piece for the first time,” he said. Most of his opponents in the race do not buy it. Some were disturbed by super PAC’s spending to bolster Sayegh’s candidacy. Some believe Sayegh and Mendez are the top two contenders in the six-person race. However, there is no credible survey ranking the six men. Jackson said Mendez is perceived as second place which is probably encouraging the attacks. Councilman William McKoy said the “connection is clear.” PACs legally cannot coordinate with campaigns. Flyer advertising Ed Farmer’s fundraiser for Sayegh. 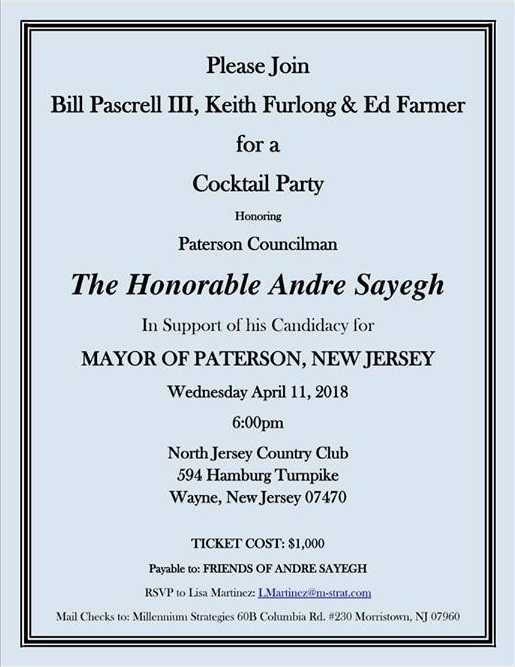 Ed Farmer, who hosted a thousand-dollar per plate fundraiser for Sayegh three weeks ago, is part of the Progressive Values Committee, according to documents the PAC filed with the New Jersey Election Law Enforcement Commission (ELEC). Farmer is the former chief of staff for congressman Bill Pascrell. He also owns a grant writing firm – Sayegh has talked about hiring a grant writer for the city. “It shows they are desperate. They have made this attempt before. They are looking to buying this election by any means by bringing in big outside money,” said McKoy. The PAC had $550,000 last year. It has $30,300 in the account, according to a finance report filed with the state on Jan. 19, 2018. Both Jackson and McKoy indicated they may file complaint for the alleged coordination between the PAC and Sayegh campaign. Maybe everybody in the whole state sees its time for a real mayor in Paterson and not these ghetto morons. But he IS a criminal! They all are! They get away with it because the voters are morons. Paterson is a city that runs on identity politics. The citizens are not morans, they have only been presented one side for decades. People in the community need to start taking an active role, by doing so, they will hopefully begin to recognize themselves as being pawns in a political pool. These politicians rely on the confuse and ignorant because it will assure victory.